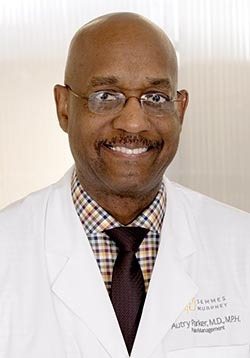 Memphis Medical Society President and Memphis native Autry Parker Jr., MD, seems as proud to be a former Wooddale High School Cardinal as he is of his medical degree from Yale University - and the distinguished recognition that has followed him during his 30 years in practice as a pioneering anesthesiologist. Currently accepted views on a multidisciplinary approach to pain management were groundbreaking in 1988, when Dr. Parker focused on this approach during his residency and fellowship at Johns Hopkins Hospital. He served there as the first Blaustein Pain Fellow, following a graduate thesis that introduced early protocols for patient-controlled analgesia (PCA) that are still widely used today. His early lectures and papers on opiate therapy - regarded by some as heretical at the time - continue to serve as study guides and support continuing medical education in opiate therapy. His input as a member of the Tennessee Medical Advisory Board has aided development of today's state guidelines for pain management. After initially developing an East Tennessee pain clinic for the Anesthesia Partners group, Dr. Parker brought his family home to Memphis, where he established and operated the Parker Pain and Rehab Center for nearly 20 years before aligning his practice with Semmes-Murphey in 2010. "Up until very recently Shelby County was the one county in the state of Tennessee that had not been overly affected by the opiate epidemic," Dr. Parker said. "I like to think that's partly because of the standard of care that we expected here in Shelby County. Since there were only two or three other pain specialists here when I arrived, I'd like to think we had something to do with that." It is the dosages, rather than the opiates themselves, that led to the current epidemic, he explained. "The drugs that cause addiction behavior are all rapid-release," he said. "You want something that dissolves quickly into the bloodstream; all the addictive medications are that way." Where the previously used MS Contin, a long-acting morphine, had no immediate release and was less addictive, OxyContin (a brand name derived from "oxycodone continuous") had 30 percent immediate release and provided a potentially addictive "rush." So OxyContin "became a catalyst for the problem." The medical profession didn't light the fuse, however, Dr. Parker believes. Illicit opiates like fentanyl are a greater threat than prescription overdoses in many places, where single kilos of fentanyl -- the size of a loaf of bread -- arrive from foreign countries and can be obtained for $5,000. "If cut correctly, a person can make $1.5 million from it. That's a lot of incentive to not behave correctly," he said. He is optimistic about Shelby County's future in the opioid war, however. "The community is very aggressive with awareness; everybody's got their eyes open, vigilance is up, and that's going to help a lot as we catch people before they're out of control." In his role as president of the Memphis Medical Society, Dr. Parker admits that its mission of advocacy for the physician community is handicapped by the misperception of its relevance among younger physicians, who "just don't join." That's a problem, because "without a collective voice we are on the menu rather than at the table," he said. "The greatest challenge that faces our society faces all physicians: Decisions that affect physicians are being made by people who don't understand the unique role that physicians have. With so many people pulling in different directions, trying to get their agendas through, there's no other organization right now that really speaks for medicine. We have the AMA, but all politics starts local. We need the Society to protect our interests and the lives in our community." He points to a movement toward allowing nurse practitioners to practice independently. "I'll go on record that I don't think that is a very good idea because it's impossible for nurse practitioners, with the limited amount of training they have in comparison to a physician, to be on par with that kind of training." The current team-based model works, he said, "because many nurse practitioners are extremely well-trained and work in an environment where a physician knows their skill sets completely. So patients are directed in an appropriate environment and are seen with the level of expertise that's necessary." But when a patient with no records and new complaints needs a diagnosis and treatment plan, and physician back-up or oversight is not available -- as in the proposed non-team-based approach -- "that's something I'm not comfortable with." He also expresses concerns over the recently passed "Tennessee Together" law that goes into effect July 31, placing barriers to over-prescribing opiates and opioids. Unfortunately, it also creates barriers to prescribing appropriately, Dr. Parker noted. "It's going to make fewer doctors write opiates, period. That's their goal -- but the unintended consequence of that is that these patients are just going to go to pain clinics for the medications that have kept them functional -- and many of these pain clinics are more part of the problem than a solution. "From a medical standpoint, I'm afraid that now the pendulum is going to swing too far in the other extreme," he said. "Insurance companies, too, are requiring prior authorizations even for acute pain -- like a broken leg." Despite his high-profile challenges and achievements, however, Dr. Parker's feet are tapping. A dedicated bass guitarist, he admits that his first love was and is music. "I still play in several bands, and I'm still trying to make it and get my big break!" he joked. "But I'm lucky; my day job pays relatively well." He takes greatest pride in his three daughters who have just graduated: one from Howard Law School, one from Johns Hopkins Graduate School in education and one who is working for Amnesty International.